The winter frost is melting away and it’s time to get back into gardening. If you have young children, gardening can be a fun activity you can enjoy together as a family. Gardening projects can teach kids about nature, encourage bonding time with parents and allow children to get a little dirty. Try these spring gardening ideas for young kids. For little ones, you can start gardening indoors. It’s an easy way to teach them about seeds and how plants sprout. They can see the daily progress of their gardening project, and eventually you can transfer the plants outdoors. You can make a seed starter using any type of container. However, a cute idea begins with a trading card sleeve. Moisten potting soil and spoon it into each pocket of the trading card sleeve until each pocket is two-thirds full. In each pocket, create a hole in the soil with the pencil and drop three seeds in the hole. Cover the seeds with soil. Repeat in all nine pockets. Punch a hole in the top center of the trading card sleeve and hang it in your window using string or yarn. As an alternative, you can buy small suction cups at your local big box store and affix the sleeve directly to the window. This will allow the seeds to get great direct sunlight. Using a turkey baster, kids can water the seeds daily (or according to the package directions) to keep the soil moist. Within 1-2 weeks, the seeds should sprout. Tomatoes are the perfect choice for spring gardening with young children. They are sturdy and not too particular about the quality of soil. Even if you don’t have a big yard, you can grow tomatoes in a window box. Grow the tomato plants from seeds in small pots indoors and then transfer them outside once they’ve sprouted, or you can skip the seeds altogether. Just buy young tomato plants that are already sprouted and then plant them outdoors right away. Whatever you do, you need to wait until the weather in your area is warm enough that there’s no frost at night before transplanting them outside. Choose a sunny location and dig a hole in the ground (or in a planter or large pot) that is deep enough for all the roots and about 12 inches wide. Help your child carefully take the plant from its original container and transfer it into the hole. Pack soil in the hole and around the plant. Check the moisture level every day and water the plants as necessary. If you have any questions about how much water or sunlight your tomato plants need, visit your local gardening center and ask the staff — another fun activity for kids. You don’t want the plants to get too heavy and fall over. Therefore, when they reach about 10 inches high, you need to provide them with a little support. Stick a wooden stake into the soil right next to the plant and tie it with a string, or buy wire tomato cages at Home Depot or the gardening center to provide the support your tomato plants need. Your kids will love checking the plants every day to see them turning from green to red. When the tomatoes are red and ripe, your children can gently twist them to pick them from the plant. From seeds to harvest, talk to you kids about the growth process and all it takes to nurture the tomato plants and help them thrive. 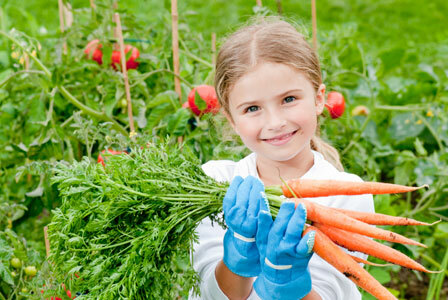 Gardening is a fun experience for young kids and the whole family. If the cold weather is still hanging around in your area, get your kids into the spring gardening spirit with some fun gardening crafts. Teach them how to make soda bottle garden shovels or how to create paper flowers for a colorful tissue paper garden. The spring weather will be here before you know it, and you’ll be enjoying gardening for many months to come.